After you have successfully registered for the 2019/2020 jamb examination at the various cbt centers located nationwide you will notice one thing. You will notice that your examination date, time and venue are still missing which is very vital and dear to you,don’t worry, this guide will teach you how to Reprint your 2019/2020 jamb registration slip successfully. We have all been there before, during our time there was nothing like reprinting of jamb slip, in fact you got to know your centers on the date you filled and submitted your forms online. But today all that has changed due to the fact that we have few and limited accredited CBT centers and couple with the fact that jamb will always try to allocated candidates based on the capacity of the cbt centers. If you are still confused on the next step to take in order to know your exams date and time then this guide is for you and you only need to read this tutorial from A-Z to get along. It has been jamb tradition to always fix a date that all candidates will reprint their slips. Some people will get an email notification from jamb which will contain their exam date, time and venue while others might get it along with an SMS from jamb. But majority of candidates won’t get this message maybe due to network failure or system errors. On this date, the jamb slip reprint portal will be made open for all candidates who have fully completed their registration and who want to Reprint de slip . 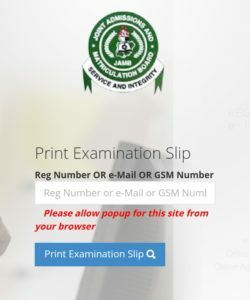 On this date all jamb candidates are expected to either go to the Jamb accredited centers or make use of their personal computer to access jamb jamb slip reprint portal where they can easily reprint their slips. You are expected to log on with your system and reprint your slips. Before reprinting your Jamb slip you need 3 information which are. GSM number you used during registration period. Once you have this 3 required details then you can now print your slip. I know why I took out time to outline these because some candidates might still forget going to the cbt centers with any of the above. Note: you can still reprint out your slip your self at any location. You are expected to enter your password and email address you used during registration. Congratulations : now you have now known your exam date, time and venue. Do you know that there will be about 3 to a maximum of 4 section on daily basis till the exam is over? This is necessary because of the few numbers of CBT centers across the country for now. If you belong to the category of those who got an email from jamb regarding your exam date and time, it’s important you print it out. Most times this mail ends up in your spam folder. So check very well for it. Once you have seen it then it’s time to print it out. Never fail to connect your system on your device as you ready to print out. Now you have to click on login button. 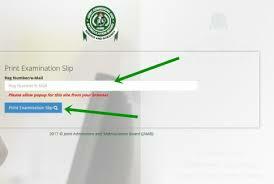 Now type in your correct jamb registration number into the box and click on reprint. Don’t know your registration number? 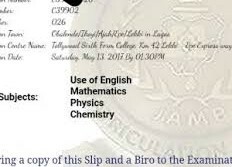 Okay don’t worry just look at the slip you were given when you first registered your JAMB you will see it. Reprinting of jamb slip is compulsory for all. To know your exam date, venue and time you must reprint your slip. You don’t need to spend up to 1000 naira to reprint, just 200 naira can do that. Make more photocopy of it so you don’t run again to the business center to reprint. You can view your slip on your phone but it’s best you make use of a laptop or computer that is attached to a printer. Please make use of chrome or Firefox, avoid opera mini. Jamb has made it clear that they won’t allow candidates to come into the hall with foreign materials. They are very determined to stamp out exam malpractice. When coming to the exam hall never you bring your wristwatch, phones, bags, biro, calculator etc into the hall. Don’t come with jewelries etc. Don’t come with glasses except it’s medically recommended. Don’t come with ATM card. Don’t come with key holder. USB, CD plates and other times related to that are prohibited. Camera, recorders any gadget are not allowed. As you are stepping into the hall ensure you are with your jamb reprinted slip that shows your exam date and time and center. We hope by now you have made photocopies of your jamb reprinted slip? If no please do that quickly. Have it in mind that you must thumbprint before entering the exam hall as this will prevent people who are not meant for the exam to step in. All subjects that appears or shows up on your JAMB reprinted slip will be the same that you will taken. Reprinting of jamb slip us free of charge, but you only need to pay those reprinting it for you a token which should not exceed just 100. If you wish to make photocopies of it which i will recommend then you can pay additional 10 naira only depending on the number of copies you want to make. Like we have mentioned before, the jamb slips contain relevant information as regards to your exams date, time and venue. Should in case you found any error such as in your name, subject combination and any other thing, be rest assured that it can be corrected through the jamb change of form which is normally sold at 2500. You are expected to bring your exam slip along with your jamb registration slip to the exam venue as this will also be a prove that you are actually sitting for the exam. Please note that you will be subjected to do a compulsory finger print verification exercise as this is used to detect fraud cases, impersonation and double registration . You will recall that the joint admission and Matriculation board jamb schedule it reprinting of slip which should take place on the 2nd of April 2019 but however due to circumstances beyond their control JAMB has to reschedule the reprinting date to 4th April. You might ask why was the reprinting of slip postponed? Well the answer to that is not far-fetched. 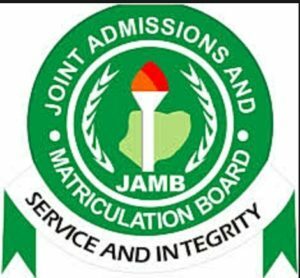 It has been on public domain that about 14 CBT centers across the country has been short down and closed due to some fraudulent practices the joint admission and Matriculation board jamb noticed during the registration process and also the mock exam. All candidates who are under the affected centers Will be redistributed or posted to other centers where they will now take their exams. Jamb has promised to work all through to ensure that reprinting starts on the new date. Another reason was because some staffs of the joint admission and Matriculation board jamb were attacked and almost lynched by some mob at the Lagos State Polytechnic center but if not for the quick intervention they would have been killed. Hence JAMB is also trying to provide adequate security in all its centers across the country as this will ensure that exams are written in a conducive environment where there will be no threat to life of staffs and candidates. JAMB in conjunction with the ministry of education has warned all centers to adhere to whatever guidelines they have been given if not they will be delisted. We believe that this article is helpful to you or are you having problems reprinting your Jamb slips? Just feel free to use the comment box and share us your thought and your experience while printing your slip. Dont forget to inform your friends on all social media about this article as it might be of help to them. communicate with one another in love. AM UNABLE TO REPRINT MY JAMB REGISTRATION SLIP, IS TELLING ME THAT REPRINTING IS OF SLIP IS NOT ALLOWED? WHY IS IT TELLING ME THAT? i am over warmed with joy over this informations that jamb has sent to us. may God blessed jamb staffs through christ our lord Amen. Follow the instruction as outlined on the page here.